[See Full Title with English Translation ~ below]. 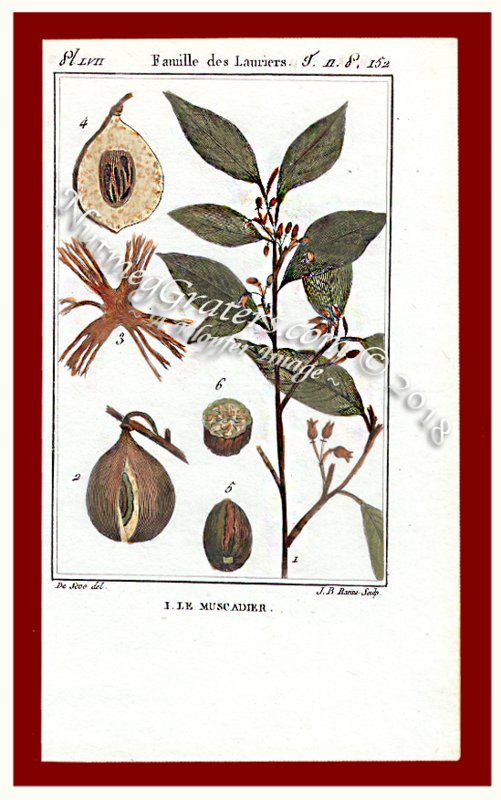 AUTHOR & PRINTED FOR: C. F. Bruisseau -Mirbel, Botanist (Paris). the arts and gardening, to include plant history and physiological characteristics. PRINT PUBLICATION: Volume 11, Plate LVII; Text Pages 152 ~ 156. ORIGINAL ILLUSTRATOR: Jacques de Sève (died 1788). ORIGINAL ENGRAVER: Jean Baptise Racine (died 1778). LEAF SIZE: 10 by 18.5 cm. HISTORY: Histoire naturelle, générale et particulière, des plantes ... was authored by Charles François Brisseau Mirbel (1776~1854) [PICTURED: Below Right]. He was a naturalist, author, botanist, bryologist (mosses and liverworts), pteridólogo (ferns), professor in botany and a politician. Mirbel is known as the founder of plant cytology (cell biology). Histoire naturelle, générale et particulière, des plantes ... consisted of 18 volumes which were sequential publications between July 1802 to 1806. In 1808, Mirbel's publications resulted in his acceptance into the French Academy of Sciences, and he become a Professor of Botany at the Sorbonne. In 1823, Mirbel married the painter of miniatures Lizinska Aimée Zoé Rue. He served as the French Secretary General under his friend Élie Decazes, but this abruptly ended when this government fell in 1829. He returned to his former position at the Museum. In 1837, Mirbel was elected a foreign member of the "British Royal Society" of London. Jacques de Sève (fl. 1742 - 1788) was a French illustrator. De Sève was commissioned by Georges-Louis Leclerc Comte de Buffon [PICTURED: Below Center] to provide illustrations for his Histoire Naturelle, Générale Et Particulière (1749-1778, an encyclopedia in 36 volumes). De Sève executed more than 2,000 drawings, wash drawing, in brown ink, all archived in the Royal Printing of his editor Buffon. Jean Baptiste Racine (1747~1783) was a French printmaker, engraver, metalworker and artisan. Both De Sève and Racine passed away decades before Mirbel's publication. Although engraved by Racine, De Sève's "LE MUSCADIER" illustration clearly resembles the Jean-Baptiste Lamarck's 1791 engraving [SEE: "Plates 883 & 884", Tableau Encyclopedique Et Methodique Des Trois Regnes De La Nature, Paris, 1979.] On Page 154, Mirbel indicates that "M. Cere, director of the national garden of the Isle of France, sent in 1788 an excellent description to M. Lamarck, who made a memoir published in the journals of the academy on all the species of the genus" which suggests De Sève modeled his small illustation based on Lamarck's work. Examining the current De Sève's print (above), notice that the engraving is smaller than the page size used in Mirbel's 1805 text book; this is suggestive that the actual engraving plates may have been created earlier for Buffon's Royal Printing works, being duplicated later within Mirbel's publication of 1805. It is likely that the engraving plate was commissioned Circa 1770 for Comte de Buffon or some other editor, years before Racine's death in 1883 and De Sève's death in 1788. Description des végétaux rangés par familles, avec des details sur leur culture, leurs usages dans la medecine, les arts, le jardinage, etc. et sur les phenomenes physiologiques qu'ils presentent. Par C. F. Bruisseau -Mirbel, aide-Naturaliste au Museum d'Histoire naturelle, professeur de Botanique a l'Athenee de Paris, et membre do la Societe des Sciences, Lettres et Arts. A Paris, De L'imprimerie de F. Dufart. Description of plants arranged by families, with details about their culture, their use in the doctor, arts, gardening, etc. and the physiological phenomena they present. By C. F. Bruisseau -Mirbel, Assistant Naturalist at the Museum of Natural History, Professor of Botany at the Athenee in Paris, and a member of the Society of Science, Letters and Arts.. In Paris, The Printing of F. Dufart.